Scandinavian countries can be either a winter wonderland or balmy summer destination. The climate varies from north to south and from west to east, so each locale has a unique temperature signature. Depending on the month you travel to Scandinavia, travelers can expect to pack shorts, bundle up with a parka, or dress in layers to accommodate the fluctuations in weather. The areas that are included as part of Scandinavia can be debated, but typically Scandinavia is considered to be comprised of Denmark, Finland, Greenland, Iceland, Norway, and Sweden. Scandinavia's regions have different climates, and temperatures vary widely between the regions. For example, the weather in Denmark follows a marine west coast climate which is typical for its location in Europe. The same is true for the southernmost part of Sweden, and the milder coastal climate touches the west coast of Norway as well, affecting the weather in Norway. The central part of Scandinavia from Oslo to Stockholm has a more humid continental climate, which gradually gives way to subarctic climate further north, a lot like the weather in Finland. Parts of the Scandinavian mountains in Norway and Sweden have an alpine tundra climate with frigid temperatures, especially in winter. Further north, in the regions of Greenland and Iceland, you experience a northern climate with cold winters. Winter months in Scandinavia run between December to March and as expected are quite chilly. However, unlike in many parts of the world, the temperature does not automatically become colder the further north one goes in Scandinavia but is primarily impacted depending on if you are on the coast or inland. For instance, the coldest recorded temperature in Sweden was -58 degrees Fahrenheit, while further north in Norway, locals consider temperatures that go below -4 degrees Fahrenheit to be an average winter night. During January, the coldest month of the year, the temperatures can dip to an average of 27 degrees Fahrenheit in places like Oslo. Visitors can expect regular snow and freezing temperatures for the majority of the winter months. What to Pack: Winters across Scandinavia are quite cold and typically can be wet. No matter where you're visiting, you'll want to pack sturdy, weather-resistant gear, including a raincoat and waterproof shoes. In the springtime (April and May), the temperatures are comfortable during the day and get a bit colder in the evenings. Travelers can expect some rainy days and some days full of sunshine as the weather is highly unpredictable during this season. The average temperature is somewhere between 39 degrees Fahrenheit and 50 degrees Fahrenheit. What to Pack: Spring is quite pleasant through the region, but can still be chilly. Bring sweaters and lots of other warm clothes for layering, but don't be surprised if a sneak sunny day has you wearing a T-shirt! Spring showers aren't uncommon, so it's worth being prepared for the rain. The summer months begin around June and taper out in September and are temperate and mild. Summer in Scandinavia is very mild with average temperatures of around 65 degrees Fahrenheit but can go as into the low 80s Fahrenheit. In July, one of the most popular months for tourism, the average daily temperatures range from 55 Fahrenheit to 72 Fahrenheit in Denmark, Sweden, and Norway. In Iceland, the weather is a bit colder with averages of 50 Fahrenheit to 60 Fahrenheit. What to Pack: Your typical summer attire—with the occasional sweater or sweatshirt for cooler nights—will serve you well during a Scandinavian summer. In many parts of the region, a good sunscreen is a must. A chill in the air will start in late September in Scandinavia and some nights will begin to feel like winter as the daylight hours drastically begin to shorten compared to summer. While the summer warmth may carry through until near the end of September by October warm clothing will be a requirement. Average temperatures in late October and November range from highs in the 50's down to the mid-30's Fahrenheit. What to Pack: Pack lots of cozy sweaters and a coat for fall in Scandinavia. While some days are still pleasantly warm, shorter daylight hours mean less sunlight and thus, cooler temperatures. Stockholm's climate is temperature, with cold, dark winters and cooler summers. In January, temperatures rarely exceed 32 F (0 C), while in June, the average high is 60 F (20 C). September is the city's wettest month. Copenhagen's weather is variable, with the best time to visit during July and August, the latter being the warmest month. June through August is also the rainiest time of the year. Snowfall is common from December through March, but accumulation is somewhat rare. Temperatures during the winter often hover around freezing. Oslo's temperatures are surprisingly warm for its northern latitude. The average winter temperature is usually around 23 F (4 C) but doesn't typically drop below 4 F (-15 C). Summers are warm, with occasional days exceeding 90 F. July and August are among the best months to visit. September is the wettest month. 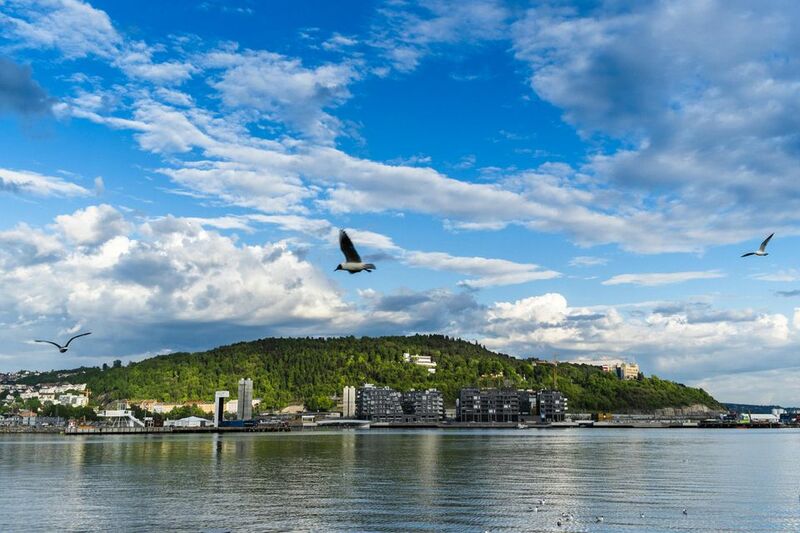 Bergen, located on Norway's western coast, has a mild climate, albeit with a lot of precipitation. It sees striking temperature differences from Oslo: The Gulf Stream keeps the sea relatively warm, while the mountains protect the city from chilly winds. Gothenburg's humid climate has grown increasingly warmer in recent years, with an average annual temperature of 45 F (7 C). July is the city's warmest month, with an average high of 61 F (16 C), while December is the coldest, averaging just 32 F (0 C).